Processes use the discovery service to register their own availability, find other processes (by process type) and subscribe to receive updates for new process availability (by process type). 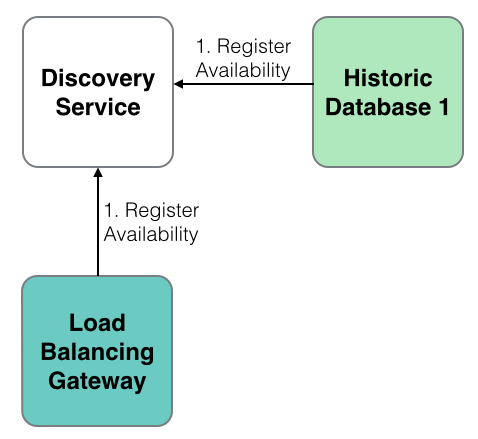 The discovery service does not manage connections- it simply returns tables of registered processes, irrespective of their current availability. It is up to each individual process to manage its own connections. The discovery service uses the process.csv file to make connections to processes on start up. After start up it is up to each individual process to attempt connections and register with the discovery service. This is done automatically, depending on the configuration parameters. Multiple discovery services can be run in which case each process will try to register and retrieve process details from each discovery process it finds in its process.csv file. Discovery services do not replicate between themselves. A discovery process must have its process type listed as discovery. Modify the configuration as required. Processes register with the discovery service. Processes use the discovery service to locate other processes. When new services register, any processes which have registered an interest in that process type are notified. The list of available processes can be found in the .servers.SERVERS table. A synchronous and asynchronous gateway is provided. The gateway can be used for load balancing and/or to join the results of queries across heterogeneous servers (e.g. an RDB and HDB). Ideally the gateway should only be used with asynchronous calls. Prior to KDB v3.6, synchronous calls caused the gateway to block so limits the gateway to serving one query at a time (although if querying across multiple backend servers the backend queries will be run in parallel). For v3.6+, deferred synchronous requests to the gateway are supported. This allows the gateway to process mulitple synchronous requests at once, therefore removing the requirement for the gateway to allow only one type of request. 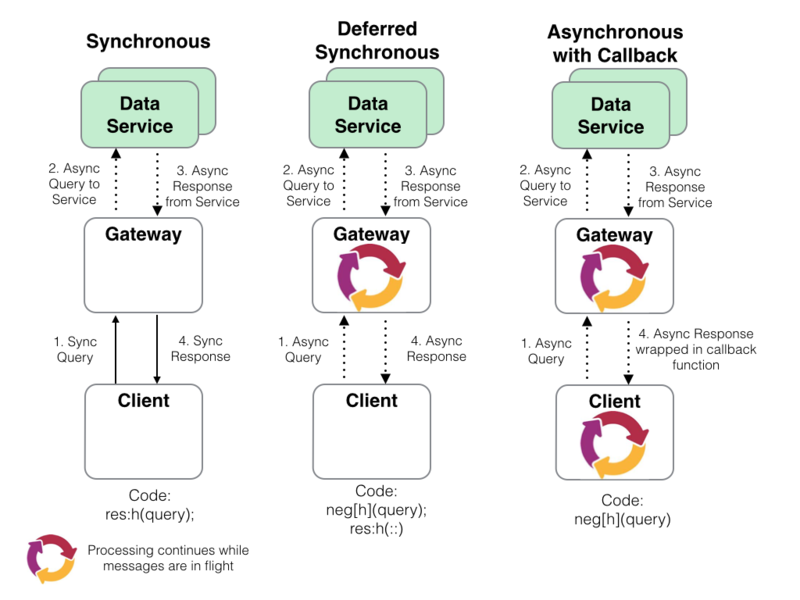 When using asynchronous calls the client can either block and wait for the result (deferred synchronous) or post a call back function which the gateway will call back to the client with. With both asynchronous and synchronous queries the backend servers to execute queries against are selected using process type. The gateway API can be seen by querying .api.p“.gw. *” within a gateway process. when all the partial results from the query are returned the results are aggregated and returned to the client. They are either returned directly, or wrapped in a callback and posted back asynchronously to the client. The two main customisable features of the gateway are the selection of available servers (.gw.availableservers) and the queue prioritisation (.gw.getnextqueryid). With default configuration, the available servers are those servers which are not currently servicing a query from the gateway, and the queue priority is a simple FIFO queue. The available servers could be extended to handle process attributes, such as the available datasets or the location of the process, and the queue prioritisation could be modified to anything required e.g. based on the query itself, the username, host of the client etc. An asynchronous query can be timed out using a timeout defined by the client. The gateway will periodically check if any client queries have not completed in the alotted time, and return a timeout error to the client. If the query is already running on any backend servers then they cannot be timed out other than by using the standard -T flag. Prior to KDB v3.6, when using synchronous queries the gateway could only handle one query at a time and cannot timeout queries other than with the standard -T flag. For v3.6+, deferred synchronous calls are supported, allowing the gateway to process mulitple requests at a time. All synchronous queries will be immediately dispatched to the back end processes. They will be dispatched using an asyhcnronous call, allowing them to run in parallel rather than serially. When the results are received they are aggregated and returned to the client. 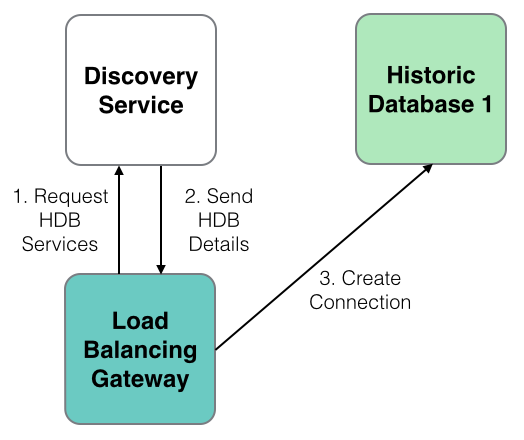 The gateway uses the discovery service to locate processes to query across. 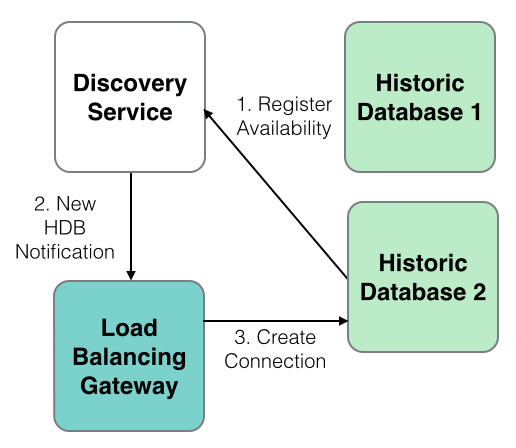 The discovery service will notify the gateway when new processes become available and the gateway will automatically connect and start using them. The gateway can also use the static information in process.csv, but this limits the gateway to a predefined list of processes rather than allowing new services to come online as demand requires. If postback functions are used, the error string will be posted back within the postback function (i.e. it will be packed the same way as a valid result). There are four main client calls. The .gw.sync* methods should only be invoked synchronously, and the .gw.async* methods should only be invoked asynchronously. Each of these are documented more extensively in the gateway api. Use .api.p“.gw. *” for more details. .gw.syncexec[query; servertypes] Execute the specified query synchronously against the required list of servers. If more than one server, the results will be razed. .gw.syncexecj[query; servertypes; joinfunction] Execute the specified query against the required list of servers. Use the specified join function to aggregate the results. .gw.asyncexec[query; servertypes] Execute the specified query against the required list of servers. If more than one server, the results will be razed. The client must block and wait for the results. .gw.asyncexecjpt[query; servertypes; joinfunction; postback; timeout] Execute the specified query against the required list of servers. Use the specified join function to aggregate the results. If the postback function is not set, the client must block and wait for the results. If it is set, the result will be wrapped in the specified postback function and returned asynchronously to the client. The query will be timed out if the timeout value is exceeded. For the purposes of demonstration, assume that the queries must be run across an RDB and HDB process, and the gateway has one RDB and two HDB processes available to it. Both the RDB and HDB processes have a function f and table t defined. f will run for 2 seconds longer on the HDB processes then it will the RDB. Run the gateway. The main parameter which should be set is the .servers.CONNECTIONS parameter, which dictates the process types the gateway queries across. Also, we need to explicitly allow sync calls. We can do this from the config or from the command line. Start a client and connect to the gateway. Start with a sync query. The HDB query should take 4 seconds and the RDB query should take 2 seconds. If the queries run in parallel, the total query time should be 4 seconds. We can send multiple async queries at once. Given the gateway has two RDBs and two HDBs avaialble to it, it should be possible to service two of these queries at the same time. Alternatively async queries can specify a postback so the client does not have to block and wait for the result. The postback function must take two parameters- the first is the function that was sent up, the second is the results. The postback can either be a lambda, or the name of a function. Asynchronous queries can also be timed out. This query will run for 22 seconds, but should be timed out after 5 seconds. There is a tolerance of +5 seconds on the timeout value, as that is how often the query list is checked. This can be reduced as required. "error: query has exceeded specified timeout value"
Some of the unofficially supported APIs may only allow synchronous calls to be made. The tickerplant log file will be written to hdb/database. See the top of the file for more information. End of day timezone can be configured (see eodtime.q). The WDB process provides flexibility so it can be set-up as a stand-alone process that will both save and sort data or two separate processes (one that saves the data and another that will sort the data on disk). This allows greater flexibility around the end of day event as sorting data can be time consuming. It is also helps when implementing seemless rollovers (i.e. no outage window at end-of-day). saveandsort - the process will subscribe for data, periodically write data to disk and at EOD it will flush remaining data to disk before sorting it and informing GWs, RDBs and HDBs etc. When running a system with separate save and sort process, the sort process should be configured in the processes.csv file with a proctype of sort. The save process will check for processes with a proctype of sort when it attempts to trigger the end of day sort of the data. The wdb process provides two methods for persisting data to disk and sorting at the end of the day. default - Data is persisted into a partition defined by the [partitiontype] variable, similar to the hdb partition scheme. The general scheme is of the form [wdbdir]/[partitiontype]/[table]/. And a typical partition directory would be similar to wdb/database/2015.11.26/trades/. At the end of the day, before being moved to the hdb, the data is sorted according to parameters defined in sort.csv. For each table, sort.csv will specify the columns to sort (using xasc) and apply attributes to. partbyattr - Data is persisted to a custom partition scheme, derived from parameters in the sort.csv file. The write down scheme is taken from sort.csv, to reflect the effect of using xasc at the end of day. For each table, the columns defined in sort.csv, with the parted attribute, are used to create custom partitions in the wdb. Multiple columns can be defined with the parted attribute and distinct combinations of each are generated for custom partitions. The general partition scheme is of the form [wdbdir]/[partitiontype]/[table]/[parted column(s)]/. And a typical partition directory would be similar to wdb/database/2015.11.26/trade/MSFT_N. In the above example, the data is parted by sym and source, and so a unique partition directory MSFT_N is created in the wdb directory. At the end of the day, data is upserted into the hdb without the need for sorting. The number of rows that are joined at once is limited by the mergenumrows and mergenumtab parameters. The optional partbyattr method may provide a significant saving in time at the end of day, allowing the hdb to be accessed sooner. For large data sets with a low cardinality (ie. small number of distinct elements) the optional method may provide a significant time saving, upwards of 50%. The optional method should also reduce the memory usage at the end of day event, as joining data is generally less memory intensive than sorting. handling large volumes of data (larger than can fit into RAM). apply sorting and parting after all the data is written out. The tickerplant log replay script has extended usage information which can be accessed with -.replay.usage. Can be easily extended to include new user defined housekeeping tasks. Age is the ‘older than’ parameter, and the function will only be carried out on files older than the age given (in days). The process reads in the csv file, and passes it line by line to a ‘find’ function; providing a dictionary of values that can be used to locate the files required. The find function takes advantage of system commands to search for the files according to the specifications in the dictionary. A search is performed for both the match string and the exclude string, and cross referenced to produce a list of files that match the parameters given. The files are then each passed to a further set of system commands to perform the task of either zipping or removing. Note that an incomplete csv or non-existant path will throw an error. The remove and zipping functions form only basic implimentations of the housekeeping process; it is designed to be exended to include more actions than those provided. Any user function defined in the housekeeping code can be employed in the same fashion by providing the name of the function,search string and age of files to the csv. As well as being scheduled on a timer, the process can also be run immediately. Adding ‘-hk.runnow 1’ to the command line when starting the process will force immediate running of the actions in the housekeeping csv. Likewise, setting runnow to 1b in the config file will immediately run the cleaning process. Both methods will cause the process to exit upon completion. Calling hkrun from within the q process will also run the csv instructions immediately. This will not affect any timer scheduling and the process will remain open upon completion. run more than one function on the specified file. optionally move the file to a new directory after running the function. store a table of files that have already been processed. run the function only on new files or run it every time the file is modified. ignore any matching files already on the system when the process starts and only run a function if a new file is added or a file is modified. The file alerter process has four parameters which should be set prior to use. These parameters can either be set in the config file or overridden on the command-line. If they are not set, the default parameters will be used. The parameters are as follows. inputcsv - The name and location of the csv file which defines the behaviour of the process. The default is KDBCONFIG/filealerter.csv. polltime - How often the process will scan for matching files. The default is 0D:00:01, i.e., every minute. alreadyprocessed - The name and location of the already-processed table. The default is KDBCONFIG/filealerterprocessed. This table will be created automatically the first time the process is ran. skipallonstart - If this is set to 1, it will ignore all files already on the system; if it is set to 0, it will not. The default value is 0. The files to find and the functions to run are read in from a csv file created by the user. This file has five columns, which are detailed below. path - This is the path to the directory that will be scanned for the file. match - This is a search string matching the name of the file to be found. Wildcards can be used in this search, for example, “file*” will find all files starting with “fil”. function - This is the name of the function to be run on the file. This function must be defined in the script KDBCODE/processes/filealerter.q. If the function is not defined or fails to run, the process will throw an error and ignore that file from then on. newonly - This is a boolean value. If it is set to 1, it will only run the function on the file if it has been newly created. If it is set to 0, then it will run the function every time the file is modified. movetodirectory - This is the path of the directory you would like to move the file to after it has been processed. If this value is left blank, the file will not be moved. "/path/to/dirA" "fileA. *"   copy    0   "/path/to/newDir"
"/path/to/dirB" "fileB.txt" email   1   ""
"/path/to/dirA" "fileA. *"   delete  0   "/path/to/newDir"
The file alerter process reads in each line of the csv file and searches files matching the search string specified in that line. Note that there may be more than one file found if a wildcard is used in the search string. If it finds any files, it will check that they are not in the already processed table. If newonly is set to 1, it only checks if the filename is already in the table. If newonly is set to 0, it checks against the filename, filesize and a md5 hash of the file. The md5 hash and the filesize are used to determine if the file has been modified since it was processed last. If the found files have not been processed already, it then attempts to run the specified function to these files. After the process has run through each line of the csv, it generates a table of all files that were processed on that run. These files are appended to the already processed table which is then saved to disk. The file alerter will attempt to move the files to the ‘movetodirectory’, if specified. If the file has already been moved during the process (for example, if the function to run on it was ‘delete’), the file alerter will not attempt to move it. Although the process is designed to run at regular intervals throughout the day, it can be called manually by invoking the FArun command from within the q session. Similarly, if new lines are added to the csv file, then it can be re-loaded by calling the loadcsv command from the q session. Each stage of the process, along with any errors which may occur, are appropriately logged in the usual manner. The file alerter process is designed to work on both Windows and Unix based systems. Since many of the functions defined will use inbuilt system command they will be need to written to suit the operating system in use. It should also be noted that Windows does not have an inbuilt md5 hashing function so the file alerter will only detect different versions of files if the filename or filesize changes. The reporter process is used to run periodic reports on specific processes. A report is the result of a query that is run on a process at a specific time. The result of the query is then handled by one of the inbuilt result handlers, with the ability to add custom result handlers. Fully integrated with the TorQ gateway to allow reports to be run across backend processes. The reporter process has three parameters that are read in on initialisation from the reporter.q file found in the $KDBCONFIG/settings directory. These settings are the string filepath of the input csv file, a boolean to output log messages and timestamp for flushing the query log table. Once the reporter process has been initiated, the reports will be scheduled and no further input is required from the user. By default, the process takes its inputs from a file called reporter.csv which is found in the $KDBCONFIG directory. This allows the user complete control over the configuration of the reports. As the queries are evaluated on the target process, local variables can be referenced or foreign functions can be run. Table [table:reportertable] shows the meaning of the csv schema. When running a report on a gateway, the gateway field must be set to the proctype of the gateway that will be queried. It will then run the report on the processes which are listed in the proctype field and join the results by using the function specified in the joinfunction field. If there is no join function then the reporter process will not start. Multiple entries in the proctype field must be separated by a space and are only allowed when the gateway field is not empty. If gateway field is empty and there are multiple entries in the proctype field then the reporter process will not load. Listing [code:csvschema] shows an example of the schema needed in the input csv file. There are several default result handlers which are listed below. Custom result handlers can be defined as required. The result handler will be invoked with a single parameter (the result of the query). writetofiletype - Accepts 3 parameters: path, filename, filetype and data. When writing to file it uses a date time suffix so the resultant filename will be usage_rdb_2014_01_02_15_00_12.txt e.g. splaytable - This accepts 3 parameters: path, file and data. This splays the result to a directory. The result must be a table in order to use this function e.g. emailalert - This accepts 3 parameters: period, recipient list and data. The period dictates the throttle i.e. emails will be sent at most every period. The result of the report must be a table with a single column called messages which contains the character list of the email message. 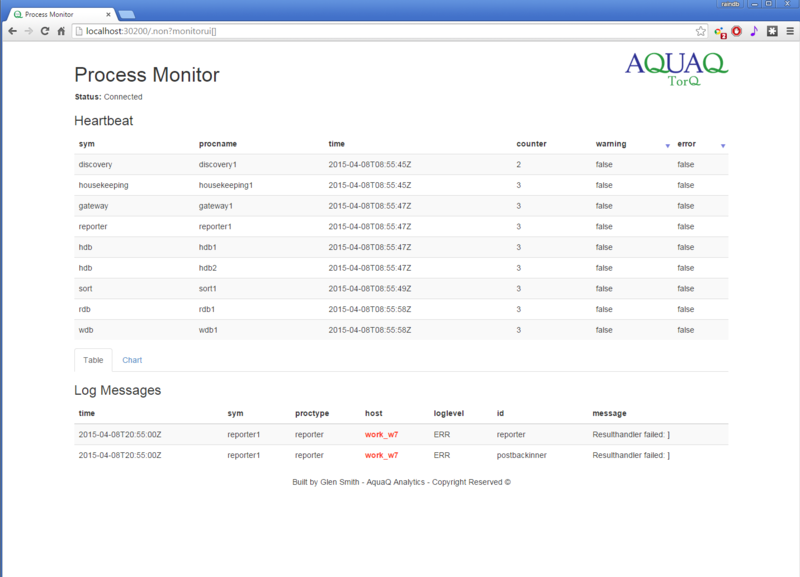 This is used with the monitoring checks to raise alerts, but can be used with other functions. emailreport - This accepts 3 parameters: temporary path, recipient list, file name, file type and data. The data is written out as the file type (e.g. csv, xml, txt, xls, json) with the given file name to the temporary path. It is then emailed to the recipient list, and the temporary file removed. publishresult - Accepts 1 parameter and that is the data. This is discussed later in the subsection subresults. Custom result handlers can be added to $KDBCODE/processes/reporter.q . It is important to note that the result handler is referencing local functions as it is executed in the reporter process and not the target process. When the query has been successful the result handler will be passed a dictionary with the following keys: queryid, time, name, procname, proctype and result. 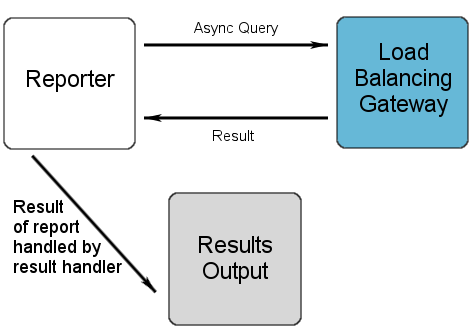 Each step of the query is logged by the reporter process. Each query is given a unique id and regular system messages are given the id 0. The stage column specifies what stage the query is in and these are shown in table [table:stagetable]. An appropriate log message is also shown so any problems can easily be diagnosed. The in memory table is flushed every interval depending on the value of the flushqueryloginterval variable in the reporter.q file found in the $KDBCONFIG/settings directory. 2014.10.20D22:20:06.597035000| 37 R "Received result"
2014.10.20D22:20:06.600692000| 37 R "Running resulthandler"
2014.10.20D22:20:06.604455000| 37 C "Finished report"
2014.10.20D22:30:00.984572000| 38 R "Running report: rdbtablecount against proctype: rdb on handle: 7i"
2014.10.20D22:30:00.991862000| 38 R "Received result"
2014.10.20D22:30:00.995527000| 38 R "Running resulthandler"
2014.10.20D22:30:00.999236000| 38 C "Finished report"
2014.10.20D22:30:06.784419000| 39 R "Running report: rdbtablecount against proctype: rdb on handle: 7i"
2014.10.20D22:30:06.796431000| 39 R "Received result"
To publish the results of the report, the reporter process uses the pub sub functionality of TorQ. This is done by using the using the inbuilt result handler called publishresult. In order to subscribe to this feed, connect to the reporter process and send the function shown below over the handle. To subscribe to all reports use a backtick as the second parameter and to subscribe to a specific reports results include the reporter name as a symbol. The following are examples of reports that could be used in the reporter process. The rdbtablecount report will run hourly and return the count of all the tables in a rdb process. The memoryusage report will run every 10 minutes against the gateway for multiple processes and will return the .Q.w information. Both of these reports run between 9:30am to 4:00pm during the weekdays. The report onetimequery is an example of a query that is run one time, in order to run a query once, the period must be the same as the difference between the start and end time. The Monitor process is a simple process to monitor the health of the other processes in the system. It connects to each process that it finds (by default using the discovery service, though can use the static file as well) and subscribes to both heartbeats and log messages. It maintains a keyed table of heartbeats, and a table of all log messages received. It is probably advisable to run the monitor process with the -trap flag, as there may be some start up errors if the processes it is connecting to do not have the necessary heartbeating or publish/subscribe code loaded. 2014.01.07D12:25:17.457535000 hdb1 aquaq ERR      reload  "failed to reload database"
2014.01.07D13:29:28.784333000 rdb1 aquaq ERR      eodsave "failed to save tables : trade, quote"
The checkmonitor.q script extends the functionality of the monitor process. Upon start up, the CSV file is loaded and inserted into the in-memory table, checkconfig. During this insertion, each check will also be assigned a unique checkid number. For each check, the query will be sent via asynchronous requests to the specified processes and waits for postback of the results. Once the monitoring process receives the result of the query, it will then be checked by the resultchecker function to identify whether it will pass or fail. Result checker functions must only take two parameters: p- a parameter dictionary, and r- the result row. The status in r will be modified based on whether the r result value passes the conditions specified by the resultchecker function. This example checks whether the trade table within the rdb is larger than 10. As this is true, the status has been set to 1h and no error message has been returned. This information is inserted into the checkstatus table, which is the master table where all results are stored. 1      | datacount tradecount rdb1    2019.02.18D10:58:45.908919000 2019.02.18D10:59:45.911635000 1      0D00:00:00.000017000 0D00:00:00.002677000 1           0       ""
In addition to tracking the status of the specified queries, a number of metrics are also returned in the checkstatus table. The function checkruntime uses the running column to identify functions that are running extremely slow, and set their status and timerstatus to 0h. When the process is exited, the .z.exit has been modified to save the checkconfig table as a flat binary file. This will then be preferentially loaded next time the process is started up again. The process of saving down the in-memory functions makes altering configuration parameters easier. Four functions are available to do so: addcheck, updateconfig, updateconfigfammet and forceconfig. addcheck[dictionary] addcheck allows a new check to be added, and accepts a dictionary as its argument. The keys must be a match to the current checkconfig table, and the values must be of the correct type. updateconfig[checkid;paramkey;newval] updateconfig changes the parameter key of an existing check, using the checkid to specify which check to alter. The type of the new parameter value must match the current value type. forceconfig[checkid;newconfig] forceconfig changes the parameter keys of an existing check and will not check for types. updateconfigfammet[family;metric;paramkey;newval] updateconfig changes the parameter key of an existing check, using the family and metric combination to specify which check to alter. If this combination does not exist, the function will return an error. The type of the new parameter value must match the current value type. There are other additional functions that are useful for using the check monitor. currentstatus Will return only status, timerstatus, result and running from the checktracker table. It accepts a list of checkids, or will return all checks if passed a null. timecheck Will check the median time for current checks to be run against a user-defined timespan. It returns a table displaying the median time and a boolean value. statusbyfam Function will return a table of all checks from specified families, ordered firstly by status, and then by timestatus. If a null is provided, ordered checks from all families will be returned. All checks can be tracked using the table checktracker. Here, each run is assigned a unique runid- thus individual runs for each check can be tracked. For each run, it tracks the time tkane for target process to recieve the query, as well as the execution time. The result value will also be displayed. Modify the settings file or override variables from the command line as appropriate. The kill process is used to connect to and terminate currently running processes. It kills the process by sending the exit command therefore the kill process must have appropriate permissions to send the command, and it must be able to create a connection (i.e. it will not be able to kill a blocked process in the same way that the unix command kill -9 would). By default, the kill process will connect to the discovery service(s), and kill the processes of the specified types. The kill process can be modified to not use the discovery service and instead use the process.csv file via the configuration in the standard way. If run without any command line parameters, kill.q will try to kill each process it finds with type defined by its .servers.CONNECTIONS variable. In tick+ architecture the main tickerplant is the most important component, as it is relied upon by all the real time subscribers. When the tickerplant goes down data will be lost, compare this to an rdb which can be recovered after it fails. The chained tickerplant process is an additional tickerplant that is a real time subscriber to the main tickerplant but replicates its behaviour. It will have its own real time subscribers and can be recovered when it fails. This is the recommended approach when users want to perform their own custom real time analysis. Chained tickerplant settings are found in config/settings/chainedtp.q and are under the .ctp namespace.